The Ibanez Tube Screamer is a guitar overdrive pedal, made by Ibanez. The pedal has a characteristic mid-boosted tone popular with blues players. The "legendary" Tube Screamer has been used by guitarists such as Stevie Ray Vaughan to create their signature sound, and is one of the most popular, most copied and "modded" overdrive pedals. The pedal has a drive knob, a tone knob, and a level knob. The drive knob adjusts gain, the tone knob adjusts treble and the level knob adjusts the output volume of the pedal. The pedal is used to try to mimic the sound of a vintage tube amplifier. The classic Tube Screamer sound includes a "mid-hump", which means that the circuit accentuates frequencies between the bass and treble ranges (mid-frequencies). Some guitarists prefer this sort of equalization, as it helps to keep their sound from getting lost in the overall mix of the band. The tube screamer pedal was preceded by the orange "Overdrive" (OD) and green "Overdrive-II" (OD-II). These came in narrower boxes without battery covers. 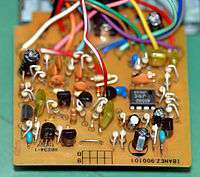 There was also a reddish "Overdrive-II" which had a housing very similar to the TS-808/TS808. The green OD-II had a circuit similar to the TS808; however, the OD and OD-II had a more distorted circuit. TS-808/TS808: The first Tube Screamer, the TS808, was released in the late 1970s. It was equipped with the Japanese JRC-4558 chip. Some units however had the Malaysian Texas Instruments RC4558P chip. TS9: From 1982 to 1985, Ibanez produced the "9-series" of effects pedals. The TS9 tube screamer is almost the same internally as the TS808. The significant change in the TS9 circuit was the output. This caused the tube screamer to sound brighter and not as smooth. In later years, TS9s were assembled with seemingly random operational amplifier chips, instead of the called-for JRC-4558. After the 9 series was discontinued, the "Master" or "L" series was produced. This series was only made in 1985, and did not have a tube screamer in the lineup. A rare and valuable version of the tube screamer was the ST9 Super Tube Screamer, which was sold only in Europe and Australia. TS10: In 1986, Ibanez began production of the "Power Series", which included the TS10 tube screamer. The TS10 had about 3 times more changes to the circuit than the TS9 had. Some TS10 pedals were made in Taiwan, using a MC4558 chip. All TS10s (as well as other L- and 10-series pedals) used floating jacks and pots, which were mounted to the boards instead of the cases. This is weak point in the design sometimes causing the jacks to break off. TS5: The plastic TS5 "Soundtank" followed the TS10 and was available until 1999. The TS5 circuit is very similar to the TS9; however, it was made for Ibanez in Taiwan by Daphon. First year of production had a metal casing, afterwards the casing was made out of plastic (which resulted in more noise than a typical TS808/TS9 box made out of metal). However, these plastic versions still have a shielded and grounded metal bottom plate for a slight interference reduction plus the needed weight to keep the pedal from sliding because of its light weight. TS7: The TS7 "Tone-Lok" pedal was released in 1999. It was made in Taiwan like the TS5, but in a aluminium case that was more durable. The circuit inside had a "hot" mode switch for extra distortion and volume. Most TS7 pedals came with the JRC4558D chip, like the TS808 and TS9. The TS9 and TS808 pedals have been reissued, and according to the company, feature the same circuitry, electronics and design components that helped shape the famous Tube Screamer sound. Some musicians have a technician perform modifications to the unit to change the sound to their liking. Also, Maxon, who produced the original Tube Screamer pedals for the Ibanez brand in the 1970's - 1980's, produce their own version of the Tube Screamer (called Overdrives: the OD-808 and OD-9 as oppose to Tube Screamer, TS). According to Susumu Tamura (田村進) of Maxon, the designer of the Tube Screamer, the initial design concept was to create something to compete with BOSS OD-1 and MXR Distortion+. In doing so, he used an innovative circuit, using the monolithic operational amplifier device, introduced in early 70s, to create a pedal sound different from the "discrete" transistorized 60's fuzzes. The overdrive is produced using two silicon diodes in anti-parallel arrangement into the negative feedback circuit of a operational amplifier ("op-amp") circuit, to produce soft, symmetrical distortion of the input waveform. When the output exceeds the forward volt drop of the diodes the amplifier gain is much lower, effectively limiting the output to + and - one diode volt-drop, although due to the exponential I-V curve of the diodes this is not a hard limit. A "drive" potentiomenter in the feedback path provides variable gain. The original 4558 based circuit uses transistor buffers at both the input and the output, to improve impedance matching. This is mathematically equivalent to mixing the input signal with a clipped version of itself, however. Thought of this way, it is said that this "preserves the original dynamics of the input signal which otherwise would get lost at the threshold of clipping" and "avoids muddiness and vastly improves clarity and responsiveness." Characteristic of the distortion is the symmetrical nature, which produces mainly odd-order harmonics for a sine wave input. All this justifies the "vacuum tube" sound, and the "screaming" tone. As well, Tamura added a simple but effective post-distortion equalization circuit with a first-order high-pass shelving filter that "is linearly dependent on its gain", an approach called "progressivity". The overdrive stage is followed by a simple low-pass filter and active tone control circuit and volume control, using the second op-amp available on-chip. The circuit uses transistor buffers at both the input and the output, and a modern electronic field-effect transistor (FET) "noiseless" bypass switching to turn the effect on and off. The TS7 allows switching between a "TS9" mode, in which the circuit and all relevant component values are identical to the vintage model, and a "Hot" mode, which introduces an additional gain stage. Yet another variant is the Ibanez ST9 Super Tube that features a fourth knob ("Mid Boost"), which provides a harder attack. Much has been made of the operational amplifier chips used in the various versions of the Tube Screamer pedal, and several "fairy tales" have been written on the subject. The JRC4558D chip is well-regarded by some. The (RC)4558 is a low priced, general purpose dual operational amplifier, introduced mid 70's by Texas Instruments as an "improved" version of the early 741, and used in thousands of consumer and industrial designs. In fact, JRC4558D is nothing else than the licensed product manufactured by Japan Radio Company (日本無線株式会社), and identical to any other 4558 chip. Other popular chips used included the TL072 (a JFET input type, highly popular in 80's), "original" TI RC4558P, and OPA2134. The TA75558 (yet another version, made by Toshiba), standard in the TS10 alongside the 4558, is strangely regarded as the "ugly duckling of TS opamps". The pedal was popularized by Stevie Ray Vaughan. Phish guitarist Trey Anastasio implements two TS9 Tube Screamers in his rig. It is widely used in genres as diverse as country, blues and metal. The Tube Screamer has since spawned many clones and modified versions. Possible modifications include use of mismatched, or different diodes (for example, a silicon and a germanium device), or more than two diodes in various arrangements, or modified tone circuits. It is also used by the majority of metal guitarists before the lead channel of the high gain amps to make distortion more focused and to cut the low end. Notable modifiers of the pedal include Robert Keeley of Keeley Electronics and Steve McKinley of Tube Screamer Mods.com. 1 2 3 Hunter, Dave (2004). Guitar effects pedals: the practical handbook. Hal Leonard. pp. 68–71. ISBN 978-0-87930-806-3. ↑ Bolembach, Kevin (October 3, 2013). "State of the Stomp: Maxon's Susumu Tamura Interview". Premier Guitar. Retrieved 2016-09-17. 1 2 Topaktas, Bogac. "Tube Screamer's Secret". BTE Audio. Retrieved 13 September 2010. ↑ Zölzer, Udo; Xavier Amatriain (2002). DAFX: digital audio effects. John Wiley and Sons. p. 125. ISBN 978-0-471-49078-4. ↑ "Harmonic distortion". rhordijk.home.xs4all.nl. Retrieved 2016-02-07. ↑ "Ibanez Tube Screamers History". Analogman.com. Retrieved 13 September 2010. ↑ Möller, Andreas. "The "true" TS-808 chip ...". Stinkfoot Electronics. Archived from the original on 12 June 2010. Retrieved 13 September 2010. ↑ "Converting modern Tubescreamers into the real 808 version" (PDF). And do remember that the op-amp has very little to do with the actual clipping in a TS circuit. It's just there to amplify the signal - the diodes [do] the clipping. Changing one or both of the diodes will make a huge impact on the overdrive character, while the differences incurred by different op-amps are minute. ↑ "The JRC4558 Myth". electrosmash.com. Retrieved 2016-02-09. in a guitar pedal there are a lot of factors that can modify the sound even more than the opamp can do: the components placement, values tolerance, circuit layout, the power supply, etc ... by actual listening test as well as oscilloscope traces and spectrum analysis, there is no audible difference between today's 0.5$ NJM4558D and the old ones. ↑ "Ibanez Tube Screamer". musicradar.com. Retrieved 1 September 2011. ↑ Tucker, Lindsay (November 2011). "Builder Profile: Keeley Electronics' Robert Keeley". Premier Guitar. Retrieved 20 January 2012.